Although her competitive career was now effectively over, Maria’s love for the game has prevailed throughout her later life. Replacement hip surgery in April 1992 slowed her down for a while but Maria’s well-proven recovery powers again came to her aid again and she was back to a full schedule by Wimbledon that year. She endured further surgery to her other hip in November 2001 with the same stoicism she has met all adversity in the past, returning to her personal appearances within a few short months. Now confining her play to controlled practice sessions and demonstrations, Maria continued to conduct clinics around the world. She returned to Beckenham Lawn Tennis Club in June 2004 to celebrate 125 years of grass court tennis on the famous Foxgrove Roads courts. 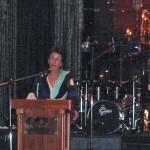 Beckenham holds a very special place in Maria’s heart and she has been an honorary member there for over 25 years. She even has her own lounge there, named in her honour. 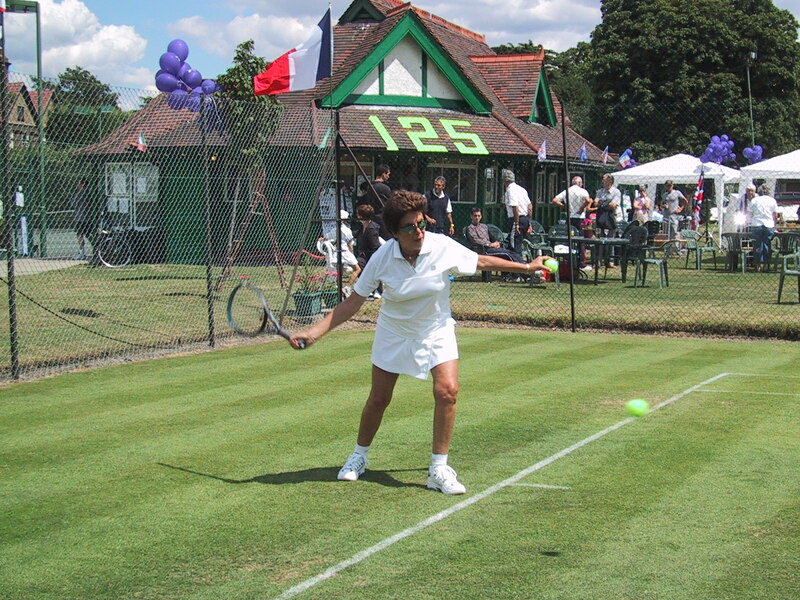 The 100 year old listed tennis pavilion was thoughtfully restored by a group of dedicated tennis members, officially re-opening in 2003 and including the ‘Maria Bueno Lounge’, which is full of interesting memorabilia relating to Beckenham’s glory days. 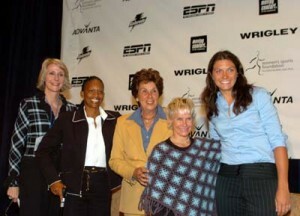 Maria was inducted into the International Women’s Sports Hall of Fame in October 2004 at the 25th anniversary of the Annual Salute to Women in Sports Award Dinner held at the Waldorf Astoria in New York. Some of the best female athletes in the world were presented in the Grand March during the gala event, and awards were given out for their significant contributions to the development of women’s sports, raising more than $1 million to help advance the lives of girls and women through sports and physical activity. Attended by over 1,400 corporate and individual benefactors, the benefit featured some 80 Olympic and champion female athletes representing over 35 amateur and professional sports. 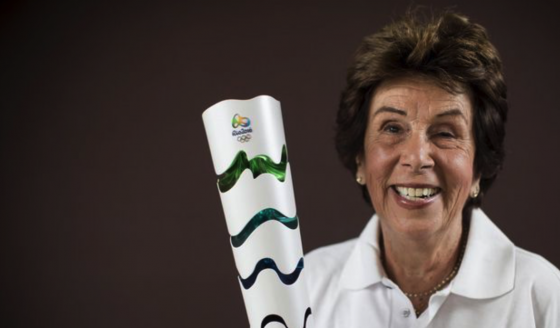 The following year saw her becoming an ever-familiar figure at Brazil’s major professional tennis events where she worked with organisers to help entertain sponsors and VIP guests as an Ambassador for the sport. In December 2005, Maria found herself having an unexpected hit with Martina Hingis in front of a capacity crowd on Copacabana Beach and thoroughly enjoying the impromptu challenge. 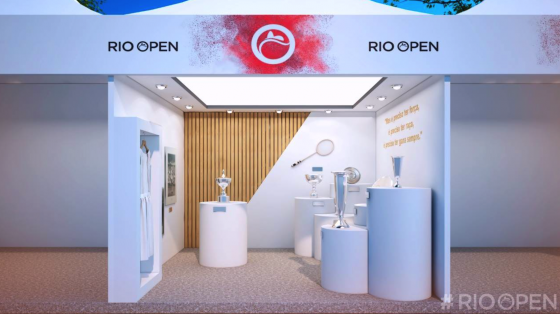 Maria was in Rio de Janeiro to conduct clinics for the event sponsors while Martina was there to play Anna Kournikova in an evening exhibition match. 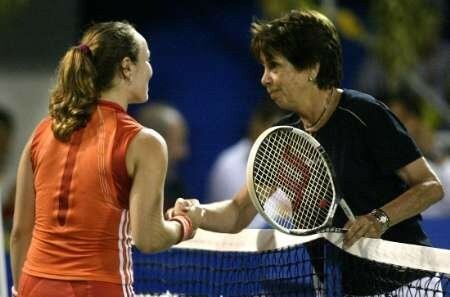 When Anna was forced to retire after a whitewash first set because of blisters on her hand, Martina invited Maria out of the stands to help entertain the spectators and the crowd went wild. 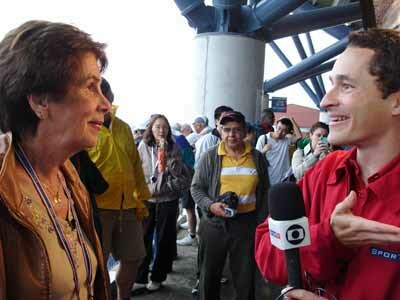 By now Maria was establishing herself as a popular colour commentator on Brazilian television and was becoming ever-more recognisable by a whole new generation of tennis lovers. It was to become her new career as she Maria has honed her commentating skills on Sportv, TV Globo’s sports channel that is aired in Brazil via cable and satellite. In November 2006 she featured as colour commentator for the Tennis Masters Cup in Shanghai and was back in action In early December for the Davis Cup final. Viewing figures spiked when she was on air, and the powers that be at TV Globo and SporTV quickly recognised her value in broadcasting. She has since also become a regular contributor for Wimbledon, the US Open and other major tennis events as well as the 2012 London Olympic Games. In May 2006 Maria was invited to Rome during the ATP Tour Master Series tournament to receive the prestigious Raccheta D’Oro Award ahead of the men’s final, and also was presented with a special award from the Mayor of Rome in the form of a ring shaped like the Coliseum. 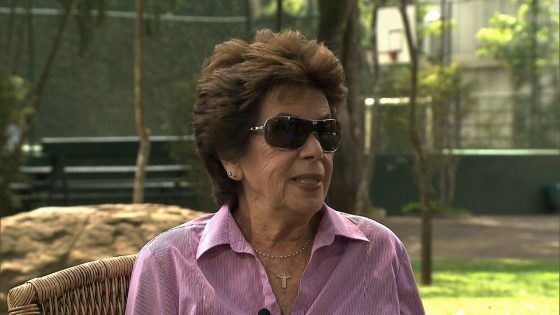 In April 2007, Maria underwent her third hip surgery, the procedure necessary due to the gradual deterioration of the original hip replacement that was done in 1991, and, yet again, she was back to work at Wimbledon for TV Globo, hitting tennis balls once more a few months later and the commentating on the Pan American Games held in Rio de Janeiro that July, and on to the US Open in August. The following year she covered both Wimbledon and the Beijing Olympics from the studios in Rio but was on site for the US Open in late August. 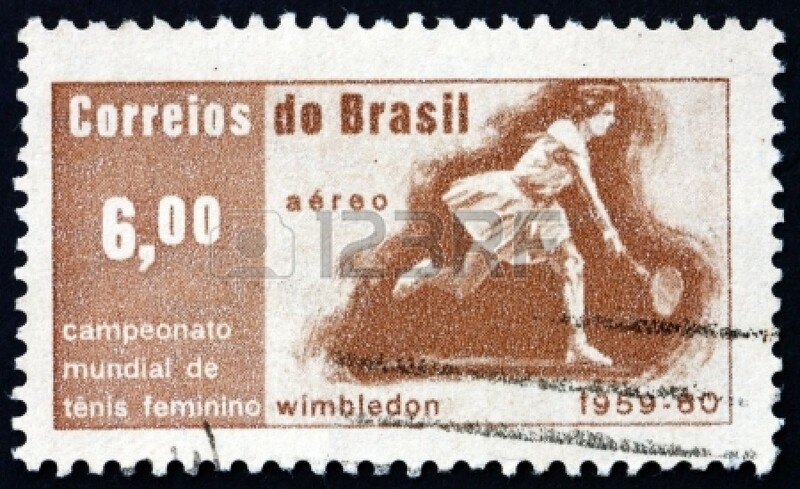 In April 2009, Maria celebrated alongside Brazil’s capital city’s 50th anniversary, a full half-century since her first singles crown at Wimbledon when, at the tender age of 18 she was requested by the President Juscelino Kubitschek de Oliveira to return home so the people could honour her in July 1959. It so happens that Kubitschek completed the building of Brasilia during his Presidency and so it was more than appropriate for Maria to visit the capital to join in the festivities that included the finals of the World Beach Volleyball Championships. It was the start of a series of celebrations that included appearing at London’s Dorchester Hotel as the keynote speaker at the International Club’s annual ball on the eve of Wimbledon where she honoured by the tennis fraternity with great love and affection. Maria, wearing an elegant gown created by Issa, the London-based Brazilian dress designer Daniella Helayel, gave a ten minute speech that had the 400 guests laughing and left them misty-eyed. After describing her home-coming after winning The Championships, she said: “We almost didn’t make it as we lost two of the plane’s four engines and had to emergency land in Bahia. “We finally arrived in Sao Paulo twelve hours late and instead of it being noon it was midnight but the church bells were ringing and the factories had their sirens going while thousands of people lined the route from the airport to the club– it was incredible! 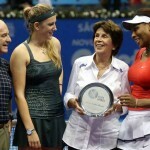 Maria was further honoured during the semi final between Kim Clijsters and Serena Williams when on Arthur Ashe Stadium in New York during the US Open where she was given a standing ovation. “I was very touched,” she said later. “It means a lot to me to have my accomplishments recognised because I feel made a contribution towards women’s tennis that is sometimes forgotten by the younger generations who think it the WTA. 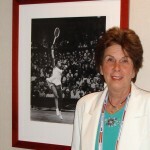 That is certainly not the case with the founder of the Women’s Tennis Association, Billie Jean King, who is quick to acknowledge the remarkable career of Maria Bueno at every given opportunity. 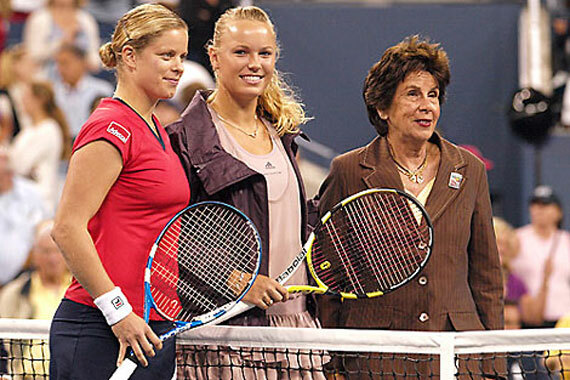 And recognised she was again when USTA President, Lucy Garvin, invited her to conduct the coin toss on court at the start of the women’s final between Kim Clijsters and Carolina Wozniacki. It was the first time the honour was bestowed to anyone other than the chair umpire at the US Open. And the crowd loved it too. Bueno and Sharapova met in Sao Paulo in December 2009, both former world number ones and Wimbledon champions, and although the great Brazilian leads the tally with 19 Grand Slam titles to her name and topped the world rankings in 1959, ’60, ’64 and ‘66, the Russian is a superstar in her own right and attracts huge attention wherever she goes. 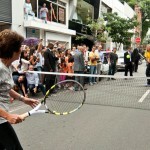 They met at the Nike store for a photo-call and blocked traffic on Oscar Freire, playing tennis over a make-shift net in the road and drawing the attention of passers by. 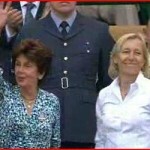 People stopped their cars to get out and watch, clapping the two Marias as they volleyed balls to each other. 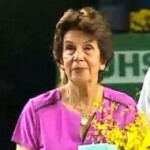 In May 2010, Maria returned to the French Open for the first time in many years as a guest of the FFT President, Jean Gachassin and was pleased to see Guga (Gustavo Kuerten) receive the Philippe Chatrier Lifetime Achievement Award from the ITF. 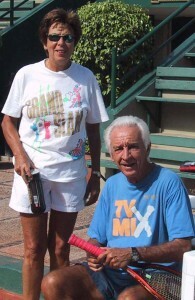 Philippe Chatrier, whose name now graces Roland Garros’ centre court, was a lifelong friend of Maria’s and she was his special guest at the French Championships for many years when he was President of the French Tennis Federation as well as the International Tennis Federation. After a full year, Maria realised that her shoulder needed some major treatment and she endured yet another surgery to correct an old injury sustained back in 2006 when she dislocated it. 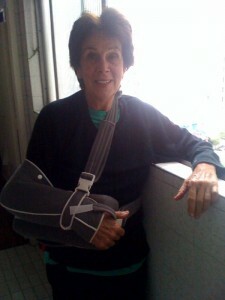 It took five-and-a-half hours of key-hole surgery on 16 February 2011 to repair her right shoulder and involved another long six month recovery before she could start hitting tennis balls again. 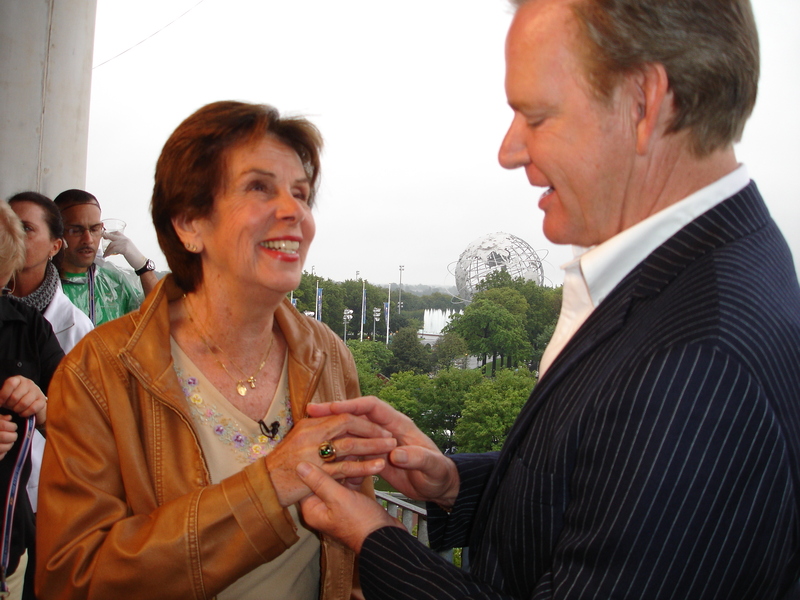 Maria received her International Tennis Hall of Fame ring at the US Open later that year and was on hand to welcome ITHOF officials to Sao Paulo in March 2012 to announce the induction of fellow Brazilian Gustavo ‘Guga’ Kuerten into the Class of 2012. Inducted in 1978, Maria is widely acknowledged as the best Latin American player of all time, while Guga was enshrined at Newport in July that year. 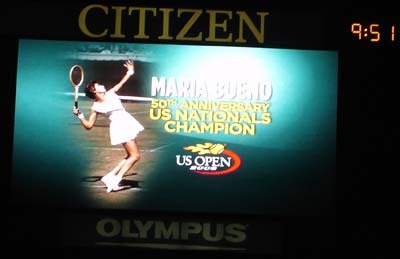 Back in London for Wimbledon and the Olympic Games, Maria exposure on television widened even further to a massive audience as she covered not only The Championships but virtually every Olympic discipline on site at the Olympic Park. Now instantly recognisable throughout Brazil, Maria’s status as a celebrity rose to greater heights in an electronic and digital era. The loss of her beloved brother, Pedro, on 11 October 2012 aged just 75, however, was a bitter blow to Maria, who had felt his support and companionship throughout her life. She was lifted from her loss by the appearance of Roger Federer in Sao Paulo on his Gillette Tour of South America, who was keen to involve Maria in the proceedings. The two met at the Player Party, where Roger was joined by Maria Sharapova, Caroline Wozniacki, Victoria Azarenka, Serena Williams, Jo-Wilfried Tsonga and the Bryan Brothers. Roger invited Maria to hit with him so he could see her legendary backhand for himself and arrangements were made for them to take to the court laid at the Ibirapuera indoor arena. Maria instructed him not to hit ‘anything spinny’, to which Roger replied that he would play her like he does with his parents and afterwards admitted she was way much better than them! As for Maria, she was just astonished at how well he hit the ball. 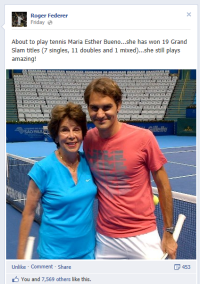 Just a few weeks later she was to enjoy Rafael Nadal’s visit to her home city too. Maria Bueno is, without question, one of the greatest legendary players of all time, held in great affection by legions of admirers around the world, including two of the best players on the planet.